PLAY ONE OF THE MOST ADDICTIVE JUMPING GAME! WE ASKED A FEW PEOPLE THEIR THOUGHTS ON THE ADVENTURE OF CHUB JUMP. HERE ARE WHAT SOME HAD TO SAY ABOUT THE GAME. What sets Adventure of Chub Jump apart from all the other jumping, flying, and racing games? SIMPLE: THIS RIDICULOUSLY FUN GAME PROMOTES HEALTHY LIVING AND STAYING FIT!! 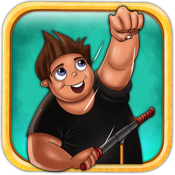 In the Adventure of Chub Jump, you guide this awesome character on a pogo-stick race and jump up as high as he can collecting as many healthy apple & chicken points possible to reach his ultimate goal — to become super healthy and fit! Using some of the most subtle and accurate tilt controls around, you must help Chub on a springy pogo-stick journey up various adventures, picking up healthy red and green apples, delicious chicken drumsticks, avoiding balls with spikes, greasy burgers and stomping on crazy pizza monsters along the way! Laugh, cry, or get mad - You will go through all this crazy roller coaster of emotions playing the crazy cute jumping Chubz while you spring your way up with delight as you stomp through endless pizza monsters and see him transforms more and more into a fit young pogo stick jumper! BE WARNED AGAIN: Insanely fun and addictive! You, your kids, grandma, and the whole family can enjoy playing this game!